This article is about the television series. For other uses, see The Real Ghostbusters (disambiguation). The series continues the adventures of paranormal investigators Dr. Peter Venkman, Dr. Egon Spengler, Dr. Ray Stantz, Winston Zeddemore, their secretary Janine Melnitz and their mascot ghost Slimer. "The Real" was added to the title after a dispute with Filmation and its Ghost Busters properties. There also were two ongoing Real Ghostbusters comics, one published monthly by Now Comics in the United States and the other published weekly (originally biweekly) by Marvel Comics in the United Kingdom. |Kenner produced a line of action figures and playsets based on the cartoon. The series follows the continuing adventures of the four Ghostbusters, their secretary Janine, their accountant Louis, and their mascot Slimer, as they chase and capture rogue spirits around New York City and various other areas of the world. At the start of the fourth season in 1988, the show was retitled to Slimer! and the Real Ghostbusters. It aired in a one-hour time slot, which the show began doing under its original name earlier that same year on January 30, 1988. In addition to the regular thirty-minute Real Ghostbusters episode, a half-hour Slimer sub-series was added that included 2–3 short animated segments focusing on the character Slimer. Animation for the Slimer! cartoons was handled by Wang Film Productions. At the end of its seven-season run, 147 episodes had aired, including the syndicated episodes and 13 episodes of Slimer, with multiple episodes airing out of production order. Slimer is shown to haunt the Sedgewick Hotel as its recurring pest. The segments added several characters as friends of Slimer and other supporting characters like a singing ice cream truck driver named Chilly Cooper, an Italian pizza chef named Luigi, a restaurant owner named Rafael who is Luigi's boss, a bellhop named Bud, hotel manager Morris Grout, socialite Mrs. Van Huego and her dog Fred, odd-job worker Rudy. Slimer had an antagonist named Professor Norman Dweeb, an archetypical mad scientist usually accompanied by a sidekick pink poodle named Elizabeth. Dweeb wants to capture Slimer to experiment on him and to gain personal glory. Dweeb also made three appearances in the main series, one a clip show from the last two seasons. Other enemies of Slimer include an alley cat named Manx, a dog named Bruiser, a tough woman named Mrs. Stone, and the ghost gangsters Goolem and Zugg as well as their boss Scareface. One of the ghosts from the Slimer cartoons, the Sleaze, also reappeared in The Real Ghostbusters to be captured a second time. 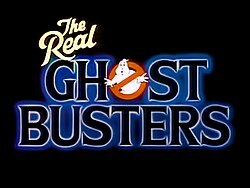 At the same time The Real Ghostbusters was being created, Filmation was making a cartoon revamp of their 1970s series The Ghost Busters, due to disagreements with Columbia over animation rights. A short pilot episode was produced, but never aired in full. The full four-minute promo was released on Time Life's DVD set in 2008. Scenes of the pilot can be seen in TV promos that aired prior to the beginning of the series. Among differences seen in the promo pilot, the Ghostbusters wore beige jumpsuits as in the film and the character design for Peter Venkman bore more of a resemblance to actor Bill Murray. The character designs by Jim McDermott were dramatically different, with color-coded jumpsuits for each character. When he auditioned for the voice of Egon Spengler, Maurice LaMarche noted that while he was asked not to impersonate Harold Ramis, he did so anyway and eventually got the part. LaMarche also noted that Bill Murray had remarked off-handedly to producers that Lorenzo Music's voice of Peter Venkman sounded more like Garfield (who was also voiced by Music at the time.) Bill Murray went on to voice Garfield in Garfield: The Movie after Music died. A different explanation for the change of actor for Peter Venkman came from Dave Coulier, who took over the role of Venkman from Music, who explained that Joe Medjuck a producer on both the original 1984 film and the animated series, wanted the character to sound more like Bill Murray. Ernie Hudson was the only actor from the films who auditioned to play his character in the series; however, the role was given to Arsenio Hall. Although the Ghostbusters concept was tinkered with, the finalized show does feature many tie-ins from the films. In the season 1 episode "Take Two", the Ghostbusters fly to Hollywood to visit the set of a movie based on their adventures, which is revealed to be the 1984 movie at the end of the episode. The Stay Puft Marshmallow Man makes numerous appearances. During the third season, Walter Peck, the Environmental Protection Agency antagonist from the original film, reappears. The uniforms and containment unit are redesigned, and Slimer is changed from a bad ghost to a resident and friend, events which are explained in the episode "Citizen Ghost" that flashes back to what happened to the Ghostbusters right after the movie's events. Gozer is mentioned repeatedly throughout the series, usually in comparison to a ghost they are currently battling (e.g. "Cthulhu makes Gozer look like Little Mary Sunshine"). In the third season, some of the character designs were modified. Ray's character design was slimmed down to give the character a less overweight appearance and Slimer was given a tail instead of the formerly rounded bottom (he reverted to a stub in season 6). The biggest change was to the character of Janine, whose hair was completely changed from being short and spiky to long and straight. Her overall design was softened, as was her personality. Her voice was also softened with Kath Soucie taking over the voice role from Laura Summer. ABC also went back, and redubbed Peter and Janine's dialogue in several episodes of the show with Dave Coulier and Kath Soucie respectively. Changes to Janine's character were eventually addressed (and resolved) in the season 6 episode (#118) entitled, "Janine, You've Changed". At the start of the series' fourth season in 1988, the opening was completely redone to center around Slimer. Eventually the episodes were expanded from their original half-hour format to last an hour, and the overall feel of the show was changed to be more youthful, with episodes having a lighter tone to be less frightening. J. Michael Straczynski was a story editor on the series, and wrote episodes for every season except four and seven. By season 5, Louis Tully was added to the show in order to follow Ghostbusters II. Recording for the show took place in Los Angeles, California. The cast always recorded together, instead of separately. After recording of the dialogue was completed, sound tapes, storyboards, backgrounds, and character designs were then shipped to DiC Founder; Jean Chalopin's Japanese studio; KK DiC (1986) /KK C&D (1987 onwards) and similar studios in Tokyo, Japan, such as TMS Entertainment and Toei Animation among others (South Korean studios during the final two seasons) for animation and filming. The show originally aired on ABC for its full run, except for the second season, which ran in syndication at the same time as the third season ran on ABC. Later, reruns of the show appeared on the USA Network's USA Cartoon Express from September 16, 1991 to September 11, 1994. Fox Family Channel also reran the series from August 17, 1998 to October 1, 1999. In August 2012, reruns began airing on Fearnet during the weekends, part of their "Funhouse" block, and on April 1, 2017 the show began to stream on Netflix. From 1986 to 1989, several episodes were released by Magic Window, the children's imprint of RCA/Columbia Pictures Home Video. The episodes on the cassettes were from the first season of syndication. In 2004 and again in 2006, Sony released bare bones episode compilations in the United Kingdom and United States respectively. The DVD release of Ghostbusters II also included two episodes of the series as bonus features, "Citizen Ghost", a story focusing on events set immediately after the first movie, and "Partners in Slime" (this episode has the original broadcast version and the original end logos (DiC "Kid In Bed" and Columbia Pictures Television (1988) logos respectively)), which featured the psycho-active slime from Ghostbusters II and a brief mention of its villain Vigo the Carpathian. On May 27, 2008, Time-Life announced they had acquired the rights to the series and would release a complete series set on DVD in the Fall of 2008. That July they allowed fans the chance to vote between two variations of an outer box for the set—one designed to look like the main characters firehouse headquarters and the other all black with different images on each side. Both featured lenticular printing, the firehouse version to show the Ecto-1 and the black version to have oozing "slime". Released on November 25, 2008, in the "firehouse" casing, the set spans 25 discs containing all 147 episodes of the series. They subsequently began releasing the individual volumes on March 31, 2009, however only the first 3 were released. Volumes 4 and 5 were not released due to poor sales. The Time-Life releases have been discontinued and are now out of print. On May 5, 2016, it was announced that Sony would begin re-releasing the series on DVD in Region 1. Volumes 1-5 (each containing 11 or 12 episodes) were released on July 5, 2016. Volumes 6-10 (with 10 or 11 episodes each) were released on September 6, 2016. Unlike the previous Time-Life edition, the Sony release did not contain the complete series, as 29 episodes were omitted, as well as the entire Slimer sub-series. Additionally, title cards were removed from all episodes in the first 5 volumes (title and writer credits were superimposed over the animated opening). On October 3, 2017, all 10 volumes, spanning 10 discs containing 111 episodes, were released in a single plastic boxset. The complete first season was released on DVD in Australia on June 3, 2009, and in the U.K. on June 15, 2009. In 1997, a sequel cartoon entitled Extreme Ghostbusters, was created by Columbia TriStar Television and Adelaide Productions. It premiered on September 1, 1997 and ran for forty episodes until its conclusion on December 8, 1997. Set several years after the end of The Real Ghostbusters, the series opened by saying the team has disbanded due to a lack of supernatural activity. Only Egon remains in the firehouse, along with Slimer, to care for the containment system while teaching classes at a local university. When supernatural events begin occurring in New York, Egon recruits four of his university students as a new team of Ghostbusters, and Janine, also one of Egon's students, returns to manage the office. The original Ghostbusters return for the two-episode season finale to celebrate Egon's 40th birthday, leading to them reluctantly working together with the younger generation to solve one last case. ^ Winston's last name was alternately spelled Zeddemore, as in the movies, and Zeddmore. ^ "Top 100 animated series". IGN. Archived from the original on May 15, 2010. Retrieved October 19, 2010. ^ "The Real Ghostbusters DVD news: Announcement for Sony Volumes 1 through 5". TVShowsOnDVD.com. May 5, 2016. Archived from the original on September 1, 2016. Retrieved September 10, 2016. ^ "The Real Ghostbusters Complete Collection". DVD Talk. Retrieved August 14, 2010. ^ "Interview: Lou Scheimer: A Candid Conversation with Filmation's Founder". The Trades. Archived from the original on April 19, 2014. Retrieved October 21, 2009. ^ "TV Listings". Daily News. New York City, New York. January 30, 1988. ^ The Real Ghostbusters Complete Collection (Booklet). Fairfax, Virginia: Direct Holdings Americas, CPT Holdings. 2008. 80083-Z. ^ Solomon, Charles (September 18, 1986). "Animated Shows For Kids". The Los Angeles Times. Retrieved August 23, 2010. ^ a b Ken Plume (January 1, 2007). "Quick Stop Interview: Maurice LaMarche". Quick Stop Interview. Retrieved August 13, 2007. ^ "Episode 90 Dave Coulier (Live Ustream)". Archived from the original on October 20, 2014. Retrieved October 20, 2014. ^ Harris, Will (June 13, 2012). "Ernie Hudson talks Oz and losing out on the Ghostbusters cartoon". The A.V. Club. Retrieved June 19, 2012. ^ "Spook Central - The Real Ghostbusters Alternate Episodes". Theraffon.net. October 18, 1988. Retrieved March 3, 2016. ^ Plume, Kenneth (September 6, 2000). "Interview with J. Michael Straczynski (Part 2 of 4)". IGN. Archived from the original on July 20, 2010. Retrieved October 18, 2009. ^ Slimer Won't Do That! The Making of The Real Ghostbusters (television film). ITV. 1990. ^ "The Real Ghostbusters: Spooky Spirits". DVD Talk. Retrieved August 14, 2010. ^ "The Real Ghostbusters: Slimefighters". DVD Talk. Retrieved August 14, 2010. ^ "The Real Ghostbusters: Creatures of the Night". DVD Talk. Retrieved August 14, 2010. ^ Gord Lacey (May 27, 2008). "Time-Life to Release Complete Series This Fall!". The Real Ghostbusters. Archived from the original on May 29, 2008. ^ "Vote for the Complete Series Artwork". The Real Ghostbusters. TVShowsOnDVD.com. July 21, 2008. Archived from the original on July 30, 2008. Retrieved August 2, 2008. ^ "Help Select the Box Art". The Real Ghostbusters. TVShowsOnDVD.com. July 21, 2008. Archived from the original on July 21, 2008. Retrieved July 21, 2008. ^ Lambert, David (November 10, 2008). "Small Date Change for Time Life's Complete Series Set is Made Up by FedEx Shipping". The Real Ghostbusters news. TVShowsOnDVD.com. Archived from the original on November 13, 2008. Retrieved November 10, 2008. ^ "The Real Ghostbusters – Cover Art 'Winner' Plus Release Date Update". The Real Ghostbusters. TVShowsOnDVD.com. August 11, 2008. Archived from the original on August 18, 2008. Retrieved August 18, 2008. ^ "Formal press release for The Real Ghostbusters — The Complete Series". The Real Ghostbusters. TVShowsOnDVD.com. July 25, 2008. Archived from the original on July 30, 2008. Retrieved August 2, 2008. ^ "The Real Ghostbusters DVD news: Announcement for Sony Volumes 1 through 5 - TVShowsOnDVD.com". tvshowsondvd.com. Archived from the original on September 1, 2016. ^ "The Real Ghostbusters DVD news: Announcement for Sony Volumes 6 through 10 - TVShowsOnDVD.com". www.tvshowsondvd.com. Archived from the original on July 17, 2016. ^ "HMV - Music, Films, & Games - hmv.com". hmv.com - home of entertainment.